This day cream light is a beautifully scented, nurturing cream which may help to protect and moisturise the skin leaving it soft, smooth and hydrated. A sister product to Rose Day Cream, this facial moisturiser has a lighter and less intensive formulation than its counterpart, but offers the same nurturing properties. 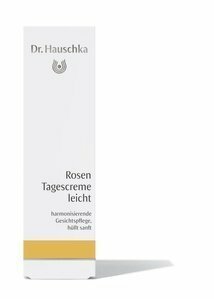 If you have any questions about this product by Dr.Hauschka, contact us by completing and submitting the form below. If you are looking for a specif part number, please include it with your message.